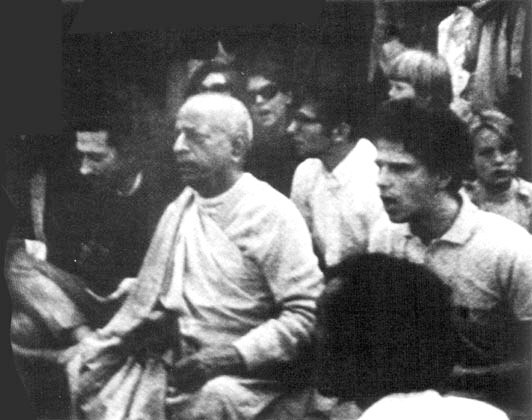 "Yes, from the very beginning I went to New York because I thought that Krishna Consciousness is the most important idea in the world, so let me go to that place, New York, which is the most important city in the world, and if I am able to do anything for Krishna and my Spiritual Master, even I am at the fag-end of my life, at least let me try for it there. So my dreams have all come true, and all of you nice boys and girls are getting the credit. When I was alone in your New York, I was thinking, who will listen to me in this horrible, sinful place? All right, I shall stay little longer, at least I can distribute a few of my books, that is something. But Krishna was all along preparing something I could not see, and He brought you to me one by one, sincere American boys and girls, to be trained-up for doing the work of Lord Caitanya Mahaprabhu. Now I can see that it is a miracle. Otherwise, your city of New York, one single old man, with only a few books to sell for barely getting eatables, how he can survive, what to speak of introducing God-consciousness movement for saving the humankind? That is Krishna's miracle. Now I can see it."